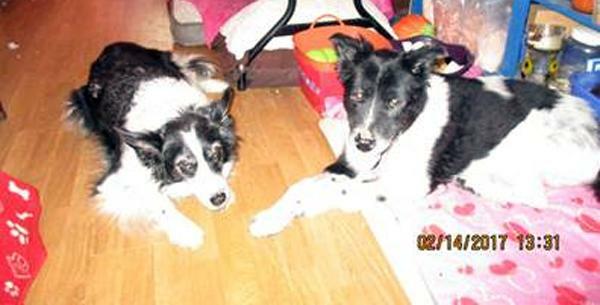 Patches is a 14 year old Border Collie mix (may be part McNab as she walks on "cat feet"), who found herself on hard times until BCIN stepped in to rescue her. She is normally in a full rough-coat but is currently shaved, and we expect her beautiful coat to come back. She is spayed, current on vaccines, dewormed and has had dental. She is a senior so it is recommended she be on supplements (we use natural ones and she responds well to them) for arthritis as well as senior vitamins. She is also a "picky eater" but trial 'n error is giving us a list of foods she likes and will eat willingly. If you like to cook for your dog this girl is for you (recipes come with your adoption). Patches is a very sweet girl. She will either bond instantly and passionately or will appear indifferent and then slowly warm up. She does not seem to have any gender specifics, it's just who she gets good vibes from! Patches is good with other dogs but she should probably not be with extremely active dogs who might knock her over, so another dog in the same generation might be best. She has bonded with our other senior foster, Oakley, and they keep each other company while the humans and younger fur-kids are out doing something. She is fairly quiet girl, but will bark if something outside the fence bothers her. She sleeps well at night, uses the dog door and loves to lie in the sun. She does not do stairs (we think she can but just has never seen them before so it might be dangerous for her to try at this age). She rides well in the car (needs a ramp to get in/out of some vehicles, enjoys a car ride and a short walk! Her favorite activity is just being with her people (2 & 4 legged). Patches is hard of hearing so she will need to be on a leash on outings or when not in a secure environment. *We (her foster home) will have updates on her progress and will be happy to provide information and answer any questions! Copyright © 2017 Border Collies In Need, Inc. All Rights Reserved.